Andrew Wise is with us today sharing some of his best article promotion strategies for bloggers. Andrew Wise is a serial entrepreneur whose sites generate $1+ million in revenue and receive 2.6+ million uniques per year. He teaches people how to start a blog online, and shares actionable advice on how you can build massive, passive income streams, designed for everyone from the complete newbie to the experienced marketer. Follow him on Twitter @WiseStartupBlog. Getting people to read your content can be difficult. There’s so much competition out there, with thousands of blogs vying for the attention of their readers, that it can sometimes feel like an outright hopeless task. Although it can be difficult to get people to pay attention to your blog posts, it isn’t impossible at all. All you need is a promotion strategy, some patience, and a little bit of luck to take your blog post from 0 views to 1,000 in no time. There are countless promotional strategies out there, ready for the taking. It’s a matter of figuring out what method(s) work best for you and what you are trying to promote. 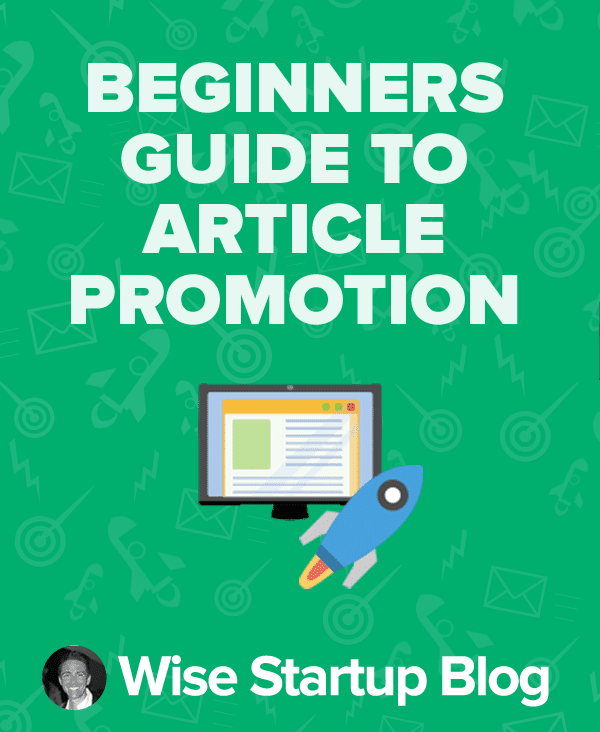 With a bit of experimentation, I was able to come up with 11 awesome article promotion strategies that helped get me 97 backlinks and 589 shares in under 30 days. I know it may sound too good to be true, but I’m here to assure you that it isn’t. These proven promotion strategies will garner you more views and shares than ever before without making you want to rip the hair out of your head. Strategy #1: Turn your blog post into a Youtube video. Some people like to read their information. Others like to watch it. There is nothing that makes one method better than the other. But if you pigeon hole yourself into one method – being a blogger who strictly makes videos or a blogger who strictly writes posts – you are cutting off what could potentially be half of your following. Making Youtube videos to coincide with your blog posts is an awesome way to tap into another audience who may have otherwise never even known you existed. All you have to do is create a short video that goes along with your post, edit it, then post it to a video hosting website like Youtube. If you link to your written blog post in the description (and link to your video in the body of your blog post), you are managing to tie both the video watchers and the blog readers together. Strategy #2: Create a “link roundup” post and include your blog. A great piece of advice is to find link roundups in your niche and promote your blog post in them. This can be extremely beneficial if you are in a niche that has many link roundups readily available to you, but what happens if you don’t? I say you make your own link roundup. It’s going to take more time and effort, but it’s a sure way to get people to head over to your blog. Often times, readers want to see the best of the best. They don’t want to settle for whatever Google is going to throw their way, so they search for link roundups with the knowledge that they are only going to find the blog posts that stand up among the greats. To create these posts, you’re going to have to allot some time out of your schedule to scour the internet for awesome niche blog posts that stand out to you – exceptional writing, great buzz, whatever the case may be – and include them in a roundup of 10-20 other posts. Somewhere in there, you can and should include your own post. Just make sure that you don’t make it all about you. Remember, people trust these roundup posts to give them the best information and you don’t want to take advantage of that post by shamelessly self promoting. Strategy #3: Share your blog post with cited sources. Even the best bloggers on the planet have to link to other posts from time to time. As a matter of fact, they SHOULD link to other posts if they want to come off as professional and trustworthy. No one knows everything and you shouldn’t pretend that you do. It’s okay to get information from other bloggers, and you should always cite your sources when you do. Authoritative links are great for any number of reasons, but you can also take advantage of having these links around for a little bit of promotion. If you reach out to the authority figures that you linked, you can easily promote yourself. First, send them an email to let them know that you found their information extremely helpful. Then, perhaps suggest that they share the post if they like it. Because they were mentioned in it, they just may do so! Strategy #4: Pay Twitter to promote your post. No one – and I repeat NO ONE – is above paid promotion. Twitter has made it easier than ever, too. All you have to do after you create a tweet is click the little stats button. From there, you will be asked if you’d like to get started with paid promotion to help your post increase in popularity. Once you fill out all of your billing information, sit back and watch the views come in. One thing worth noting about paid promotion, however, is that you are charged on a per-click basis, so it can become a bit costly. Basically, you are charged for every person who clicks on your website from your paid tweet. If you set aside a bit of extra cash to designate towards paid promotion, this should be no problem at all. Just make sure that you don’t go in blind and find yourself drowning in a sea of Twitter debt that you hadn’t originally intended on paying off. Strategy #5: Promote your content on a subreddit. For those of you who have been living under a rock for the last several years, Reddit is cool. Reddit is edgy. Reddit is a great place to promote yourself, as long as you do so wisely. Reddit has a bit of a reputation for being the snarky popular girl to combat the rest of the social media platforms. It has some bark and a bite. It also has subreddits for just about every niche that you can think of, which makes it great for promotion as long as you’re smart about it. If you join Reddit and immediately start spamming subreddits with all of your posts, you’ll be downvoted faster than you can even learn what downvoted actually means. But if you take some time to get to know your subreddit and comment around a bit, Reddit can be one of the coolest, best ways to promote your content. As a matter of fact, I promoted a Buzzfeed post I created to Reddit just a few days ago. It, along with Facebook, was the only method of promotion that I used. Fast forward to yesterday and I made it to the front page from organic views. Fast forward to today and I just received an email that the post is now going viral. I’m almost positive that’s at least in part thanks to Reddit’s promotion. Strategy #6: Seek out Facebook groups in your niche. The other method of promotion that I used was Facebook groups. There are groups for just about every niche you can imagine, so it shouldn’t be hard to find one that relates to your blog post. Once you do, join the group and take a look around. Become acquainted with the group’s rules and familiarize yourself with the format. Do a lot of people post? Does anyone comment or “like” those posts? You want to find a group that seems to have a semi-even number of likes/comments to posters. The last thing that you want is to join a group full of people wanting to promote their content, with no one who actually wants to read it. It’s just a waste of time. Strategy #7: Share your post in a subscribers-only newsletter. Once you’ve established yourself as a blogger and have a semi-steady following, the gradual next step is to create a subscribers-only newsletter. These newsletters, which should be sent out either weekly or bi-weekly, will usually include up to date information on what’s going on in your life, as well as little gifts for your subscribers for being so loyal and dedicated to you. Naturally, because these people have subscribed themselves to receive emails from you, they have proven that they’re interested in your comment. This means it makes 100% perfect sense to promote your blog posts in these emails. Just include the title of the post, a link, and a short description in the email to let your readers know that it’s out there and available to them. I almost guarantee that they’ll check it out. Strategy #8: Reply to comments on your posts. No one likes to be a lone wolf. There is a definite comfort in numbers when it comes to blogging, and people almost always feel more comfortable leaving a comment if they see that others are doing it as well. Nothing inspires people to voice their opinions quite like seeing others who do it first. To evoke comments to your post, the best advice I can offer is to make it a welcoming, open experience. If you take the time to respond to comments and leave thoughtful messages in return, you are making your readers feel like their voice is heard. If they know that their comment won’t simply be brushed aside, they may feel more inclined to get to talking. Of course this isn’t a sure science – very few things in blogging are – but it is something that will help you to not only build a relationship with your readers, but to evoke conversation among them. It will keep them returning to your blog, which in and of itself is free promotion for you. Strategy #9: Use the Yoast SEO plugin. SEO is so important for bloggers to understand, and no one does WordPress SEO quite as seamlessly as Yoast does. Their promise to help you write better content doesn’t go unnoticed, and they do so with ease. Yoast will rate everything from your blog content readability to your keywords and title, letting you know not only what you can do to improve your SEO, but what you can do to improve you writing as well. It has so many unique facets to it that set it apart from other SEO plugins in the WP marketplace, making it the top tier best of the best in my opinion. My one suggestion is to read up a bit on Yoast before you get started so you can get the most out of your experience. One of my favorite tutorials comes from the creators themselves, so make sure to give it a look and learn the basics before you dive right in. Strategy #10: Create an infographic on Fiverr. While Youtube is a great promotional strategy to reach an audience who prefers to watch their information instead of reading it, Infographics are great for people who don’t want to do either. The visual stimulation that comes from glancing at an infographic saves a heck of a lot of time and effort on the reader’s part, which makes it a great option for people who are on a time crunch or simply don’t have the patience to sit down and read or watch something for 20 minutes. Basically, infographics take all of the most important information – points, statistics, etc. – and compile them into images and graphs so that you can retain the important information and leave out the fluff. Fiverr, a marketplace for people to find freelancers, is the prime place to find a graphic designer willing to make an infographic for you on a time crunch. For just $5 (the prices can go up from there, though the base for most designers is $5), you will receive the infographic of your choosing in a few day’s time. Once the infographic is in your hands, it’s entirely up to you what you do with it. I have found from personal experience that infographics do best when promoted on social media with a link to the original article. This way, people can continue to read the article if they so wish, or they can simply glance at the infographic. Either way, they are viewing your work and receiving the information you want them to receive. Strategy #11: Make your posts easy to share with widgets. I think it goes without saying by now that you should be promoting your latest blog posts across as many social media platforms as you can manage to use and handle. What many people don’t realize, however, is just how important it is for your readers to be able to share your posts as well. While you saying that your blog post is great and informative works well for getting your foot in the door, you’re eventually going to need someone (an unbiased third party) to verify that. Social media shares do just that. That’s why you want to make this process as easy and inviting as it can possibly be. Implementing social media widgets into your posts is easy and extremely beneficial. If you include them, it saves your reader about a million steps in the sharing process. All they have to do is click a button for your post to immediately be shared with their followers. It takes them about ten seconds, and it saves you hours of promotion. As a piece of advice, I recommend your widgets go either at the very bottom of an article or on the side, so your readers can share it at any time. These prime locations not only catch the reader’s eye, but make it easier than ever for them to click and go on with their day. These are all great tips. I still have trouble figuring out reddit beyond sharing giveaways to it though. I guess I should try figuring it out! Thanks for sharing this post with us. It is obvious to me that I have been “living under a rock” for the past couple of years! Some of the strategies are ones that I was unaware of. Thanks for explaining. Contests are the strategy that keeps me coming back to a blog. I am glad you mentioned replying to posts- or to your readers. Honestly there is nothing worse than wanting to ask a question and figure out the blog is just ‘blowing in the wind’ and tweets and posts are all automated. I find that out and it is a huge turn off. Also, make sure you have LINKS the work. And your blog isnt so heavy with promotions that it is hard to comment. Oh and if you run contests (thats why I am here) try and mae sure youre not using disqus and widgets, most people have an alternate name and end up explaining who they are. BTW Shockwave crashed in chrome 3 times while typing this….. This is one of the best if not the best post I have ever read on starting your own blog. You have a good list of traffic methods here. To add more value to the list, I am going to add one more traffic source that can send unlimited traffic to any page. It is the Linkedin Groups. WIth the linkedin Groups, you can reach more people in virtually any niche. This method has really worked for me in the past. Must be tough running a blog in the first place. You have to think of topics to write about, what to call your blog etc. Blogging is definitely not for me!